Do you see what happens, Larry?? This is what happens when you forget to take a photo of everyone before they all go home! Getting really slammed with things to do right after you record is kind of a bummer… But it was also really awesome because we were in Seattle at the “Pacific Northwest’s largest Horror Convention”, Crypticon. And that was pretty much the next day! 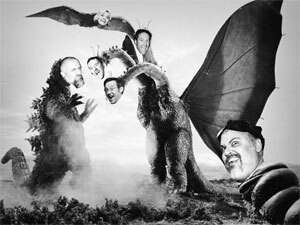 Anyway, welcome to episode 83 and the Daikaiju Discussion episode for the 1964 introduction to the triple-headed terror, Ghidorah, The Three-Headed Monster. For a long time, I actually thought this film was released in 1965, but my exploration into the film’s history revealed my ignorance! We received a LOT of homework for this episode – clearly this is a popular film amongst the listeners, so thanks to everyone who sent in their thoughts, questions and reviews! This was a late night for the Kaijucast crew – so late in fact that I wasn’t able to really sit down with the audio until last night to edit it all together (we actually recorded on the 23rd!). Make sure you check the links below to see the news items that we talk about. And we also played some requests in this episode. If you’d like to send in a music request for the next episode, feel free to use the Contact form on the website. Keep in mind that for a multitude of reasons, I cannot play every request. Check out episode 124 of Obviously Oblivious because Mike Pilot interviewed me for his podcast! Oh, do I have news for those who have waited – your day is at hand! 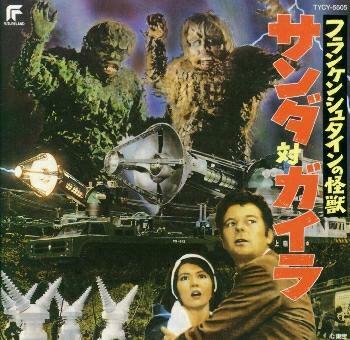 Our next film for the Daikaiju Discussion is the 1966 War Of The Gargantuas! This is a fantastic film as far as I am concerned and it really only has one flaw – I’ll let you guess what that is… I can even forgive a certain song in English that tends to get stuck in….ahhhh, nevermind! Anyway, I’m sure we are going to get a ton of reviews for this one. Please try to keep your homework less than a “page” – I can’t even figure out a word length. Nor do I want to! Regardless, I want to hear what you hav to say about the film. Use this handy form to send in your thoughts, questions & reviews before June 25th!